Featherman was chief architect of the 1996 merger of UNE and Westbrook College in Portland. 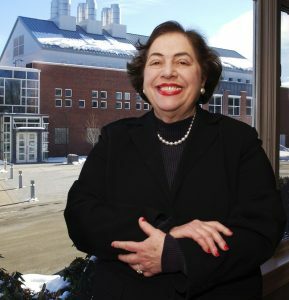 Former University of New England President Sandra Featherman, who oversaw UNE’s merger with Westbrook College in 1996 to create its Portland campus, died Thursday, three months after being diagnosed with brain cancer. She was 84. Featherman was president from 1995 through 2006. According to UNE, she oversaw multimillion-dollar renovations to academic and residential buildings on the Biddeford and Portland campuses, helped build UNE’s operating budget from $26 million to more than $100 million, and grew the endowment from $2 million to $24 million. Featherman was the chief architect of the 1996 merger of UNE’s then 1,800-student school with the much smaller Westbrook College. UNE President James D. Herbert said in a phone interview Friday that her vision for merging the two campuses laid the foundation for UNE as it exists today. During her 11-year tenure, UNE added several academic programs and majors, significantly increased student enrollment, and enhanced the school’s national reputation as a leader in the education of health care professionals. Featherman oversaw construction of the Harold Alfond Center for Health Sciences and the Marine Science Education and Research Center on the Biddeford campus, and the Parker Pavilion-Interactive Classroom buildings on the Portland campus. She was made an honorary alumna of Westbrook College in 1998 and of the University of New England in 2004. Herbert said Featherman will be remembered as a champion of the liberal arts. Her photo is displayed prominently in Alumni Hall on the Westbrook campus. A plaque acknowledging her contributions to UNE hangs at the Biddeford campus. Featherman stepped down as UNE’s president on June 30, 2006. A few days later, she took the reins of a blue-ribbon commission designated to assess Maine’s Dirigo Health program. In August 2007, she was appointed to the American Osteopathic Association’s Commission on Osteopathic College Accreditation. Throughout the years, Featherman served on dozens of boards and committees supporting a range of causes – from empowering young girls, to racial and ethnic equity in higher education. Those organizations include Girl Scouts of Maine, The Samuel S. Fels Charitable Fund, the Maine Community Foundation, Webber Hospital, and Hospice of Southern Maine. She was the wife of Bernard Featherman. The couple celebrated their 60th wedding anniversary on March 29. They lived in Highland Beach, Florida, where he previously served as mayor. The Feathermans spent summers at a second home in Kennebunkport. They had two sons, Andrew Featherman, formerly of Biddeford, and John Featherman of Philadelphia. Andrew Featherman remembered his mother Friday as a strong and insightful woman who made a profound difference in the world. Featherman was the author of more than 50 professional papers and several books, including “Higher Education at Risk: Strategies to Improve Outcomes, Reduce Tuition, and Stay Competitive in a Disruptive Environment,” published in July 2014. Her son said she was an active member of 44 different boards at one time. Featherman became sick in January. She was diagnosed with glioblastoma, the most aggressive form of brain cancer, and decided not have to treatment. John Featherman shared memories of his mother’s monthly visits to Philadelphia. He was holding her hand when she died Thursday. Featherman’s services will be held at 12:30 p.m. Sunday at Roosevelt Memorial Park Cemetery in Trevose, Pennsylvania.